61. What are the various AMI design options? Fully Baked AMI, JeOS (just enough operating system) AMI, and Hybrid AMI. 62. What is Geo Restriction in CloudFront? 63. Can S3 be used with EC2 instances, how? It can be used for instances with root devices backed by local instance storage. 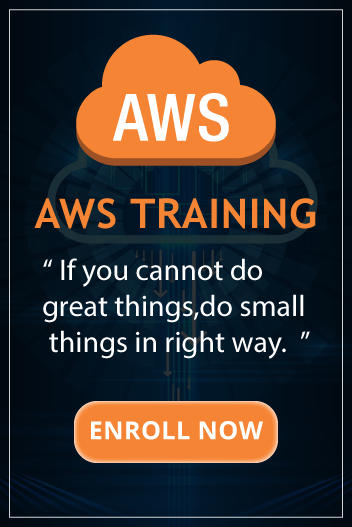 By using Amazon S3, developers have access to the same highly scalable, reliable, fast, inexpensive data storage infrastructure that Amazon uses to run its own global network of web sites. In order to execute systems in the Amazon EC2 environment, developers use the tools provided to load their Amazon Machine Images (AMIs) into Amazon S3 and to move them between Amazon S3 and Amazon EC2. Another use case could be for websites hosted on EC2 to load their static content from S3. 64. Can I connect my corporate data center to the Amazon Cloud? Yes, you can do this by establishing a VPN(Virtual Private Network) connection between your company’s network and your VPC (Virtual Private Cloud), this will allow you to interact with your EC2 instances as if they were within your existing network. 65. Is it possible to change the private IP addresses of an EC2 while it is running/stopped in a VPC? Primary private IP address is attached with the instance throughout its lifetime and cannot be changed, however secondary private addresses can be unassigned, assigned or moved between interfaces or instances at any point. 66. If I’m using Amazon CloudFront, can I use Direct Connect to transfer objects from my own data center? Yes. Amazon CloudFront supports custom origins including origins from outside of AWS. With AWS Direct Connect, you will be charged with the respective data transfer rates. 67. If my AWS Direct Connect fails, will I lose my connectivity? If a backup AWS Direct connect has been configured, in the event of a failure it will switch over to the second one. It is recommended to enable Bidirectional Forwarding Detection (BFD) when configuring your connections to ensure faster detection and failover. On the other hand, if you have configured a backup IPsec VPN connection instead, all VPC traffic will failover to the backup VPN connection automatically. Traffic to/from public resources such as Amazon S3 will be routed over the Internet. If you do not have a backup AWS Direct Connect link or a IPsec VPN link, then Amazon VPC traffic will be dropped in the event of a failure. 68. What is the difference between Scalability and Elasticity? 69. How will you change the instance type for instances which are running in your application tier and are using Auto Scaling? Where will you change it? In Auto Scaling launch configuration, Auto scaling tags configuration, is used to attach metadata to your instances, to change the instance type you have to use auto scaling launch configuration. 70. Suppose you have an application where you have to render images and also do some general computing. From the following services which service will best fit your need? Classic Load Balancer and Application Load Balancer. You will choose an application load balancer, since it supports path based routing, which means it can take decisions based on the URL, therefore if your task needs image rendering it will route it to a different instance, and for general computing it will route it to a different instance.